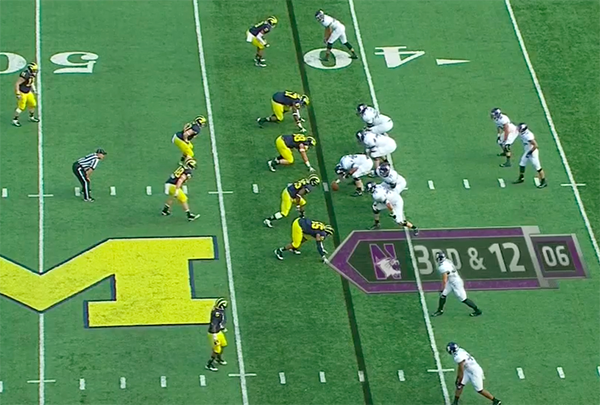 Michigan still doesn't do a great job hiding the blitz, but it's less important here. Play looks like a mirror of the blitz above. 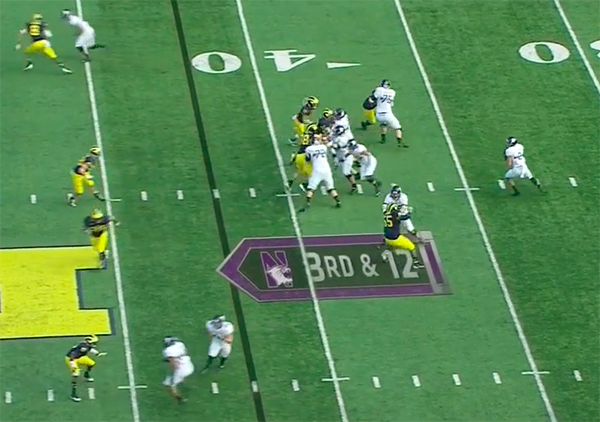 Demens drops into coverage. 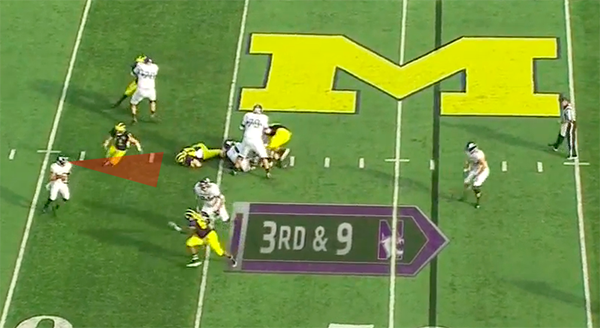 Ryan and Kovacs blitz, this time on Colter's blindside. 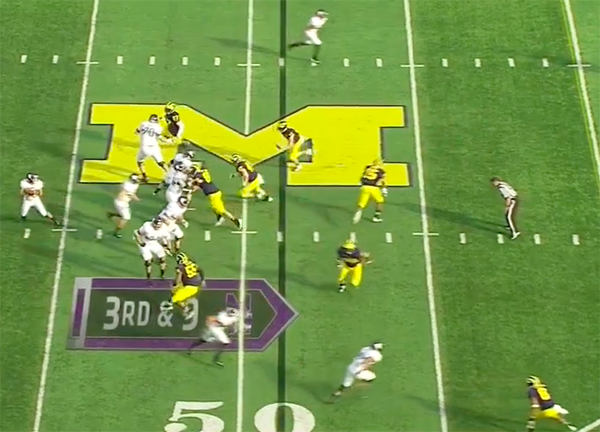 This is the moment above that Colter sees the blitz coming. He still hasn't recognized it. 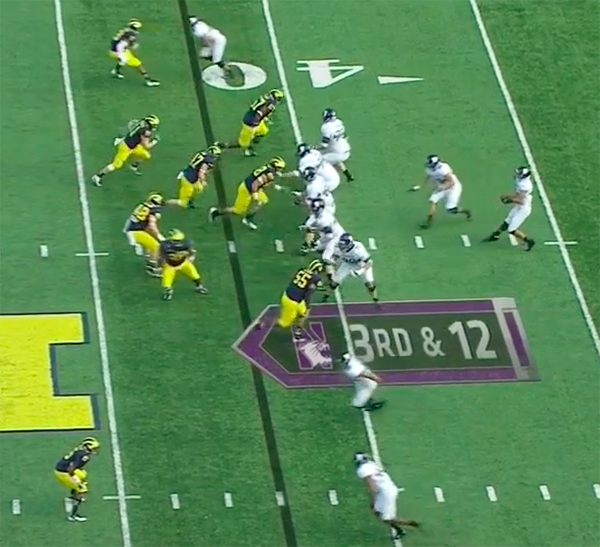 Colter is looking ahead at his open receiver but hasn't recognized Kovacs screaming down on him. 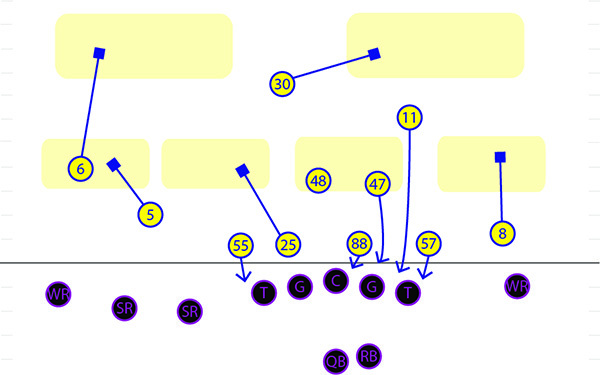 Kovacs drills Colter as he's releasing the ball and it falls to the turf. In the second video, you can see Colter try and roll away from the blitz briefly before setting his feet and throwing. 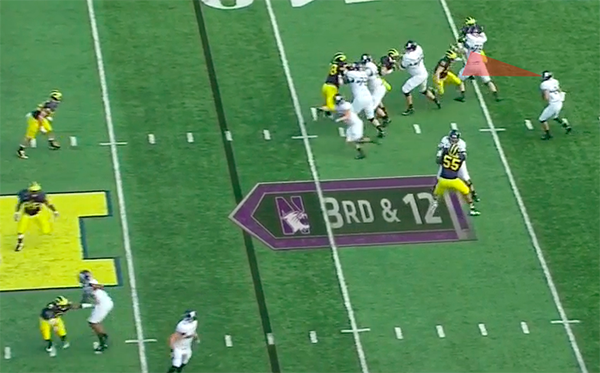 He has recognized the blitz pre-snap but has also underestimated Kovacs' speed. Because the blitz is coming from the blideside, Colter can't actually react to Kovacs other than to half roll away from the pressure. 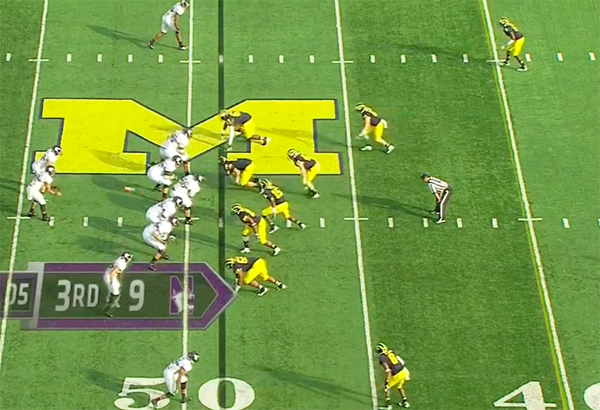 It is not a coincidence that this is the only one of these blitzes that actually works out. 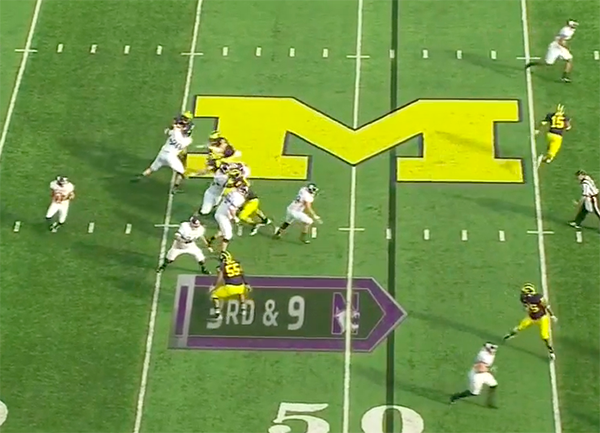 It took Mattison a little longer than ideal to recognize this, but he was able to do so mid-game and made the proper call in a crucial moment. 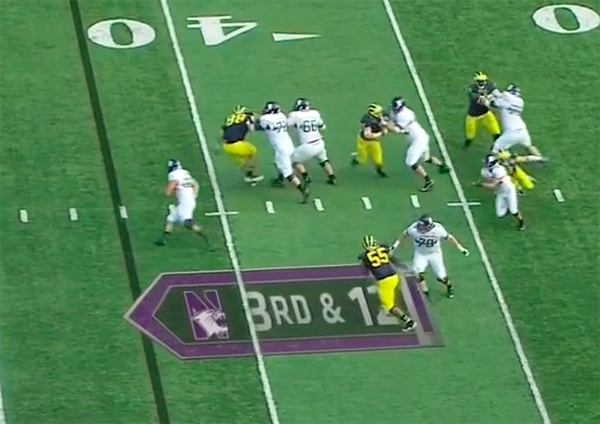 We're still yet to see a game where Mattison really uses his entire array of blitzes, but as we saw in this game, he may not be able to; certain blitzes are susceptible to various offenses, so his options may be limited. 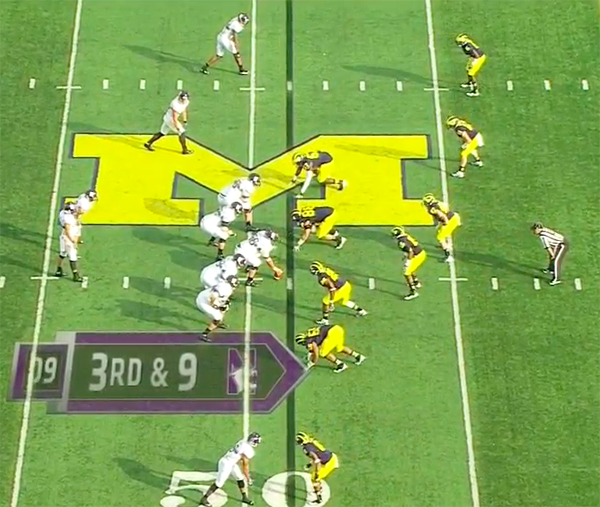 However, it's good to know he's able to analyze an opposing offense and dial up a blitz package specifically for them. 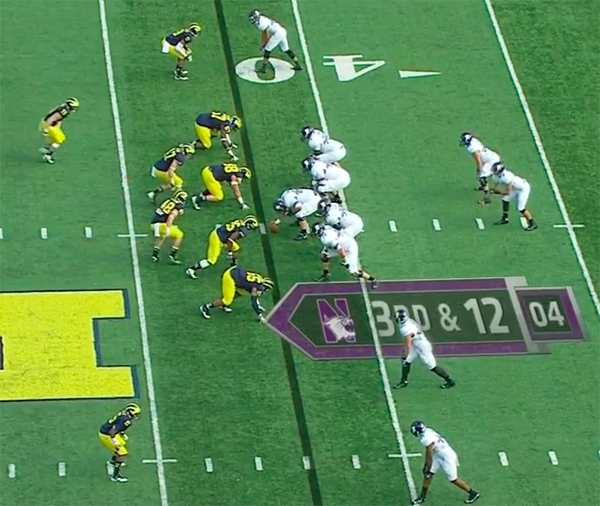 Is it possible that Mattison is playing more conservative by not blitzing so much? IOW, Mattison has more confidence in his standard defensive sets, and is choosing to not gamble with the blitz packages.